Many trees and shrubs are easy to start from a cutting. 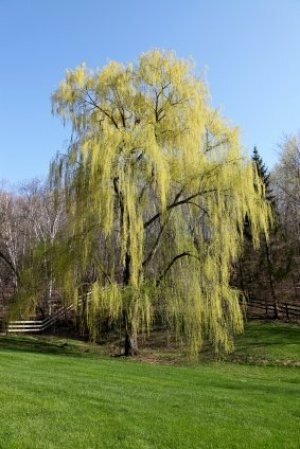 This is a guide about starting a weeping willow tree from a cutting. 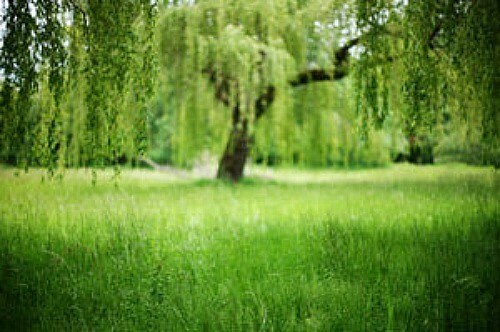 Can someone please tell me how to take a cutting from a willow tree and how to get the cutting to grow? I live in CT.
Willow cuttings root easily because the tissues contain a natural root-promoting hormone. They can be started any time of the year in pots, or outside in late winter or early spring. To start a tree from a cutting, select a healthy branch that is approximately 1/2 inch to 1 inch in diameter, and about 10-15 inches long. If planting outside in the spring, pound the branch into moist soil with a rubber mallet, leaving two or three leaf nodes exposed above ground. The site should receive at least a small amount of shade during the day to allow the roots to develop properly. Roots will start to form within a few weeks, and by fall the cutting can be carefully transplanted to a permanent site-ideally as far away as possible from foundations, water pipes and sewer lines. To root a cutting indoors, simply stick the branch in a small pot of moist soil and transplant it outside as soon as the danger of frost has passed. How do you start new trees from an existing Weeping Willow tree? Willows contain a plant hormone that promotes rooting so they are easy to propagate. A cut branch can actually be stuck directly into moist soil in the summer and roots will develop after only a few short weeks. To root other times during the year, you can start them in a vase of water and transplant them outside in the spring. Use cuttings that are about 1/2 to 1 inch thick in diameter and about 12 - 16 inches long. You can pound them into the ground with a rubber mallet until only a couple of leaf nodes (1-2 inches of the cutting) remain above the ground. You can also tie bundles of cuttings together (each about as thick as a pencil and about 3 feet in length) and lay them horizontally in shallow trenches. This will create a dense "fence" effect as the cuttings sprout. Remember that willows are invasive and grow massive roots. Keep new cuttings well away from driveways and sidewalks, foundations and septic systems. My daughter had to cut down her weeping willow after it was destroyed in a storm. We noticed that the cut logs and branches were starting to sprout. Can a new tree be started from these and, if so, how? You can just cut off one of the shoots and put it in water, or plant it, but it must be kept pretty damp till it takes root. It will grow with no problem. We have done this several times, they are pretty easy to get going. Good luck. How do I start a willow tree? All you have to do is put the cut end in water and change it every 2 or 3 days, be sure there is room between the twigs so don't crowd them in a glass or jar. Rinse the stem ends when you change the water but stop rinsing them once you see roots, just carefully flood the jar with warm water until it is clear again, once roots start appearing simply pot them up and try to keep them in a warm area, they grow like crazy so be prepared! Corkscrew willows can be kept in a pot for many years and make beautiful trees. Can I clip a piece of my downed willow and make a new willow? Willows root pretty easily and you shouldn't even need any rooting hormone (many of these compounds are made from willow anyway). If the tree has been down for a short time, you should have no trouble rooting it as the stems will still be live for a period after it has fallen. If the tree fell due to disease, I would not root cuttings as that could be transfered to the new trees. Take a cutting from new wood on the willow, about 8" long (new wood is a term for that season's growth). Leave only 2-3 leaves on it at the tip. At the base of the cutting, gently scrape off some bark on two sides of the stem. This will help roots to grow from that area. Place the stem in a 4"-6" pot with moistened potting soil. I like to use a potting mix that is for seed starting. Cover the pot with a plastic bag to keep the humidity high. Place the covered pot in a partly sunny location (morning sun is best). Check the soil daily to see if it needs watering. Spray the soil with water as needed and put the bag back on the pot. After 4-8 weeks, roots should begin to grow. You can check the drainage hole on the bottom to see if you see any roots growing or gently pull on the stem to see if you feel any resistance. If you do, then roots have started growing. Once you know roots are growing, removing the bag and continue to grow it in the pot until roots have filled up the pot. Transplant to a larger pot to grow for another year or so, before putting in the ground. I'd suggest taking more than one cutting in case some don't take root. I also have another method you could try, but not sure if it will work in your situation. You can use a technique called layering. Simply take a stem, nick the stem with a knife and then bury the wound under soil while the stem is still attached to the tree. After 6-8 weeks you can cut the stem from the mother plant and dig up the cutting with new roots attached. You can usually have a larger plant this way as the stem is still getting support from the mother plant as the new tree is growing roots of it's own. Works great for all kinds of bushes too. Can I plant a branch from a weeping willow? Should I use root hormone on it? I would say definitely on the root hormone. I know that you can root the curly willows in water first. It should not be hard either way. It is almost impossible to kill those darn things! How do you grow roots on a weeping willow cutting? My friend simply cuts a good sized stem and puts in in the ground while the leaves are still coming out. After that time, I would normally put the stem into a container of water until roots showed up. Willow has a natural affinity to 'root', in fact, you can boil willow plant, and use the cooled water to root other plants, by dipping the stem into the water, then placing in dirt. I have taken some cuttings from a large weeping willow at the end of our road. They are now well rooted and I was just wondering if these will grow into mature weeping willow trees? Yes, so be sure to give them lots of room to grow! I might actually try this myself! I received some weeping willow twigs in the mail. I've already planted them in a small pot. They're about a foot long. They are "not" branches. They are much smaller and thinner than a branch. I've had them for about 2 weeks and the willow buds are starting to sprout leaves. I've noticed that they grow more and more each day. And they seem to grow faster if I water them faster. My question is, now that they're starting to sprout, will they grow together as one tree? Or will each sprouting twig become its own tree? Also, is it possible to take the willow twigs and entwine them together so when the weeping willow tree grows, the trunk will be braided? I've tried looking all over online, and I can't find a legitimate answer. The only related searches are about pruning, watering, etc. I know all of this, I just want to know if each twig will be an individual tree. Each cutting is an individual tree, if planted in 1 clump you will have a clump of willow trees. Please check with your county extension office for more information on growing your willows, if they can be braided and any other questions you may have. I do hope this helps. Is it ok to start a weeping willow cutting in the fall? First, be sure you really, really want a willow tree. Willows are well known for their ability to locate and grow through water pipes, causing no end of problem. Some years ago, my willow tree located the gray water pipes (50+ feet away) and blocked them up. I got Roto-Rooter to come and clean them out. Then they told me their work was guaranteed for only 6 weeks! Any other type of tree would have been guaranteed for 6 months to a year or more, depending on the variety. When we cut down the willow tree, the trunk was cut into large "slices" about 2 feet high. The slices lay on the ground for a few days before we could get to clean up, but my neighbor took one to use as an accessory table on his cement patio. Within a few days, it had sprouted! There are so many lovely trees that won't interfere with your plumbing. Maybe a maple? Maples will get into the plumbing too, especially the silver maples. Any tree planted close enough is a potential problem. I started 4" cuttings one fall, held them indoors under lights in a cold basement for the winter, and set them out the next year. They are now 12 feet tall a few years later. How do I propagate cuttings of the weeping willow? I once visited a yard sale with several willows in the yard. While talking with the seller, they said that they just choose a good branch, cut at an angle, and just planted that stem. He said that it would readily root itself if kept watered. 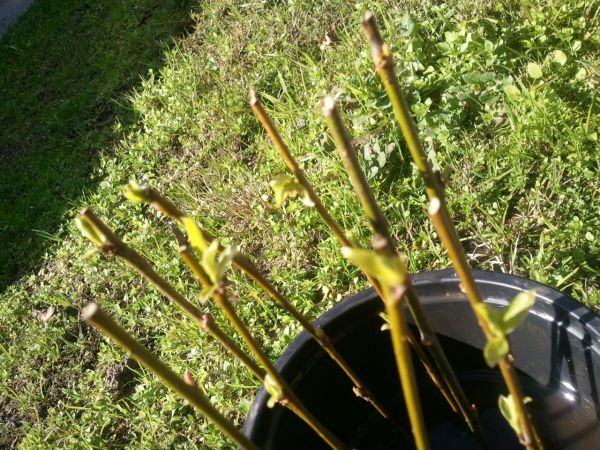 You can find a piece of new growth on a willow tree, cut or break it off and just put it in a pot of soil or into the ground and it will grow. This is very possibly, the easiest tree to grow. Just be mindful and don't put it too near your house. These trees will invade your septic system and cause major problems with your home. On Valentine's Day 2007, I received some roses with beautiful greenery! On of the pieces of greenery was a Curly Willow branch which is growing it's leaves. I live in Houston, Texas and would like to know exactly what to do to grow this Curly Willow Tree. The florist said a lot of the greenery they put in their vases comes from out of the country. So I'm not sure if this one will live here. I have it still in the vase with clean water along with other greenery that came in the vase. Also my yard is clay so I need to know what to do! I'd love to have this as a tree in my back yard. Should I put root hormone on the bottom of the stem and put it in a pot with Miracle Grow Soil? As long as it has roots now. You will have to dig a big enough hole and loosen up the soil around it. Then I would add some sand to all of the clay that has to go around the tree. Keep watering every day for a week then it should be just fine.